Here is the link: [Urban Art]. Now that summer is wrapping up, I’m also wrapping up my summer projects. 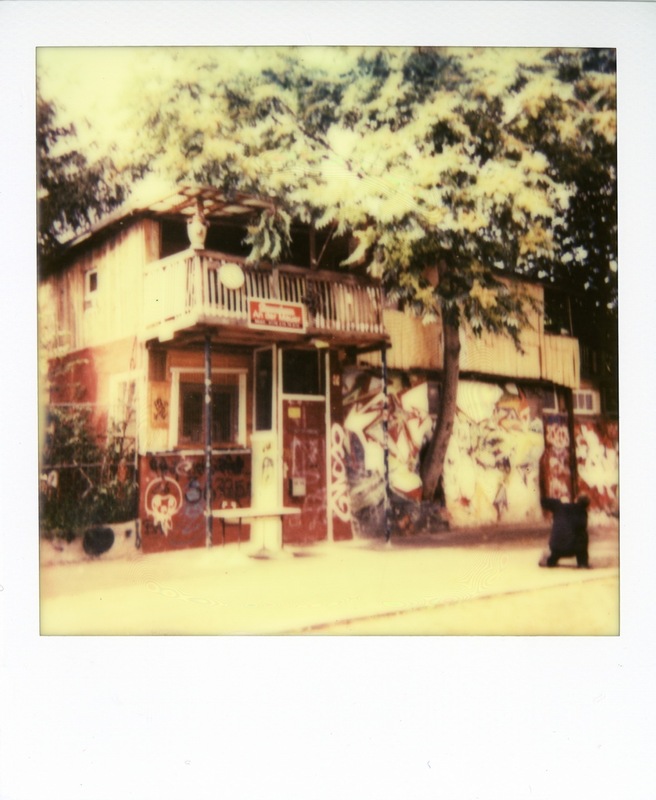 I have just added a new set of Polaroids to my site, entitled “Occupying Spaces”, a photo documentation of sorts of occupied places in Berlin. Occupying public, or indeed private, spaces has had a long history in Berlin. During the time of the Berlin Wall, at a time when living space was limited in West Berlin, many real estate developers let apartment building stand empty in order to get permission to tear the rotting buildings down and build new ones. Many, if not most, of these buildings ended up being occupied by squatters. Similarly, another phenomenon occurred on unused (or disused) public terrain: squatters used them to set up camp, living in trucks, sheds and mobile homes. As they fortified the camps against possible raids by the city authorities, these settlements became known under the Wild West term of “corral” (“Wagenburg” in German). However, that whole “cleaning up the city” act by the city government does not mean that there are no more occupied spaces today. There are still a few corrals left here and there; and a couple of squatted apartment blocks also remain. Additionally, a number of old factories and warehouses along the Spree river which are left to rot as developers are seeking permission to tear these old buildings down and erect shiny new office palaces on the much-priced water front, have now been occupied by squatters who live there, artists who work there, or modern day nomads from all over Europe who come to stay there for a while. And, it has to be said, by trigger happy tourists who have read about these places in the latest tourist guides…. Then there is the curious case of Osman Kalin’s tree house. Mr. Kalin, a Turkish immigrant, set up a garden and tree house on a patch of land that technically belonged to East Germany but was located on the Western side of the Wall. During the separation of the halves of the city, he was left alone by both authorities, but after the Wall came down, pressure was put upon him to tear down the tree house. Mr. Kalin persisted… and lives there still. Unused areas along the river also became the site for a good number of improvised beach bars – now unfortunately getting replaced by commercial venues as Berliners’ fondness for sipping beer and cocktails by the river has been established. Yet another now popular past time is for local residents to set up improvised gardens, playgrounds and even pet zoos in patches of unused and/or unclaimed land. In other words, Berliners are still busy (re-)claiming their city from what they perceive as willful negligence by those trying to make a quick buck out of… doing nothing. As one of my summer projects, I tried to document these “occupied spaces” with the Polaroid cameras. I visited occupied factories and derelict buildings, a couple of the remaining “corrals”, improvised “beaches” and camp sites. There are a couple of remarks I should add. One is that, as you can see, graffiti plays a big role in occupying these spaces – as indeed it represents a ‘marking of the territory’. As such, I extended the scope of the photo selection to also include random, interesting graffiti around the city not necessarily linked to occupied places. As to the “corrals”: the inhabitants of these camps are notoriously private and averse to visitors, especially those carrying cameras. For a good reason: since some of the tourist guide books have started “featuring” them, the corrals have become tourist attractions of their own. Thus, while I photographed the surrounding “public” areas (taken up by mostly by graffiti and art work), I did not manage to get any photos taken inside the camps proper, which I find too bad. I used primarily a couple of Polaroid SX-70 cameras with a variety of Impossible Project films, including the new “color protection” film. 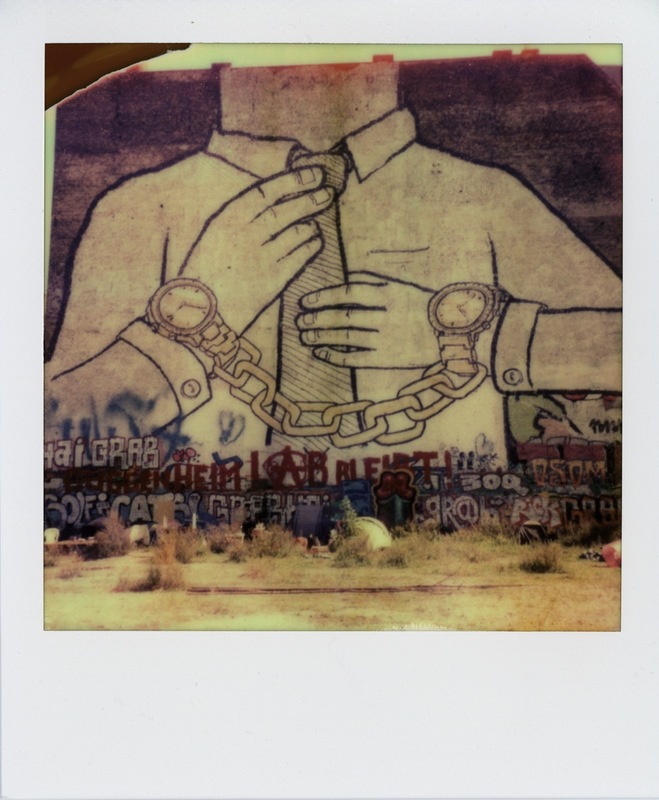 In a few instances I also used the Fuji Instax 210 camera, and I added an additional gallery with only the instax photos on urban art. 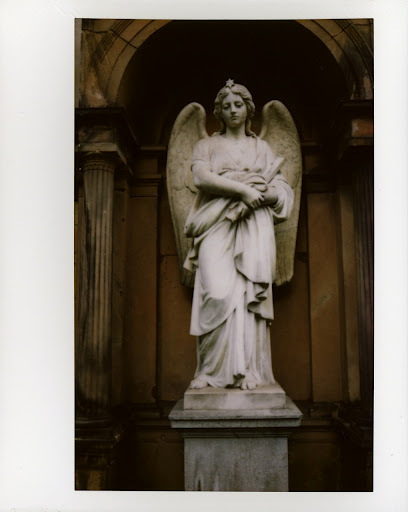 Several weeks ago, I wrote an article on this blog entitled “Peace… Eternal“, after having visited and photographed one of Berlin’s oldest and most charming graveyards. In it, I described the ambiguity I felt of being in that remote, utterly peaceful place while being constantly reminded of death. It’s stiller than the sundown. I was reminded of this poem on the week-end as I strolled through one more old Berlin graveyard. But first I should explain what I’m doing in these places. I’m not particularly attracted to death, nor am I driven to seek refuge from the city bustle among the lost graves. 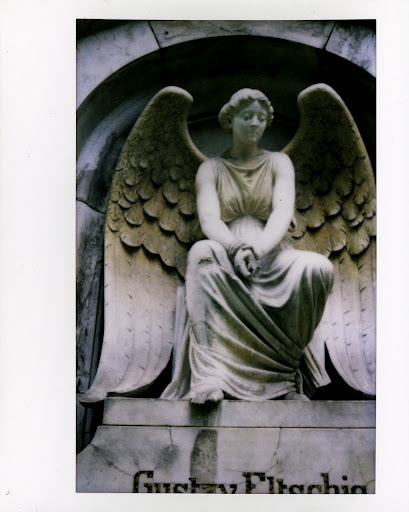 I go there, primarily, because I find cemeteries intriguing witnesses to a city’s history – a history that, in Berlin’s case, has been rather turbulent. 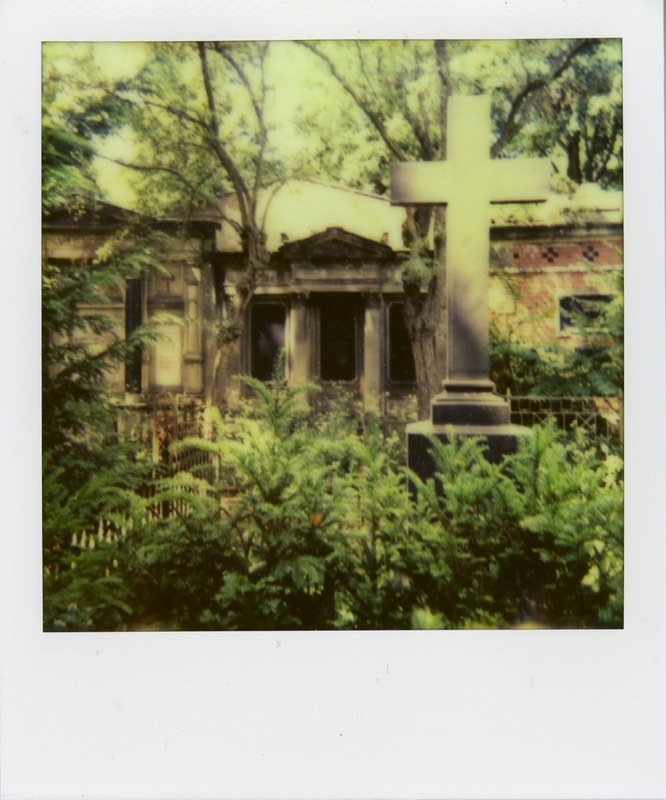 The cemeteries are a showcase of Berlin’s once great past and its downfall – but that is a topic that I would like to save for another blog post. 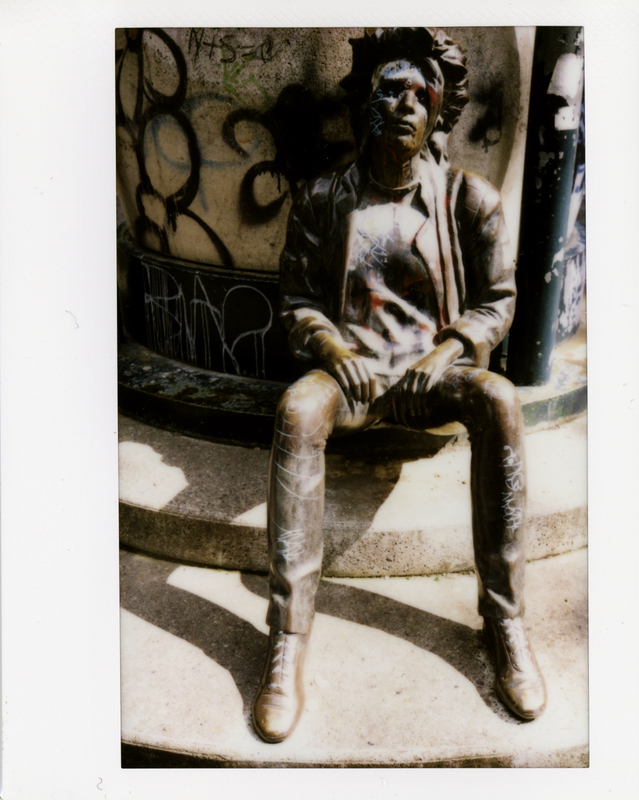 I used, once again, the Polaroid SX-70 camera and the Fuji Instax to try and capture that mood. 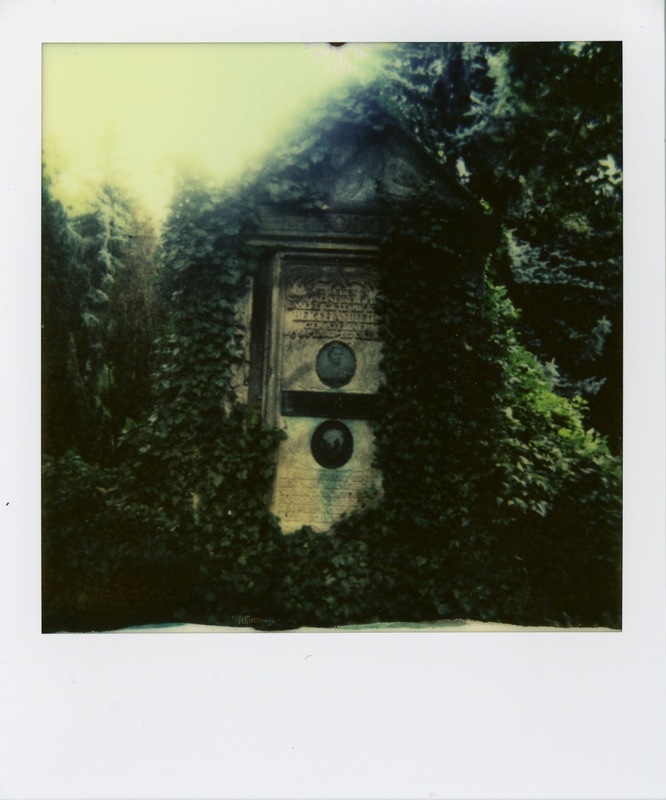 Again, I found the Polaroid camera and the Impossible Project’s Color Shade film the perfect instrument to depict the ‘otherworldly’, dreamlike state of an old light-filled graveyard full of overgrown and crumbling tombs, walls and statues. The resulting images’ tones and colours imbue them with a sense of melancholy, of past times and of loss; a mood I find very reminiscent of some of the quieter, less dramatic works of the 18th century romantic painters such as Caspar David Friedrich or William Turner, who also had a fondness for depicting ruins and old, forgotten places overrun by nature in paintings full of melancholy which reflect a yearning for simpler times. 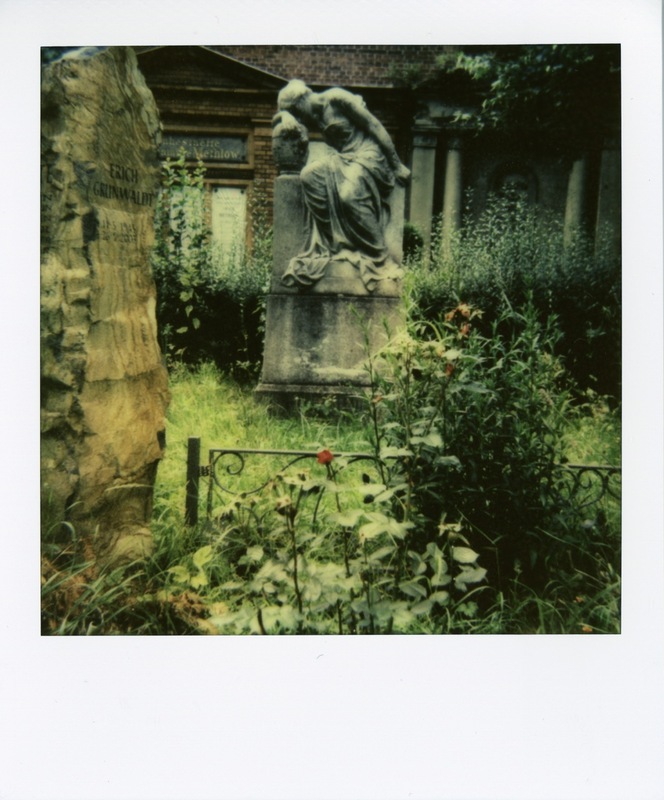 The Instax camera, on the other hand, delivers more saturated images, which paint the cemetery a different shade. Here, the photos I took in plain sunlight stress the colours of summer, highlighting the abundance of nature that has taken over these places; while in the photos taken in late afternoons or under cloudy skies, they reflect a starker, more sombre mood, where the abundance of nature seems almost menacing. I found these darker images to be the perfect conclusion for the Peace Eternal set. And here is the link to the article “The Graveyard Sensibility of Emily Dickinson” by Masud Mahmood. If there is one thing Berlin has a lot of, it’s old graveyards (granted, any old city does, but still…). 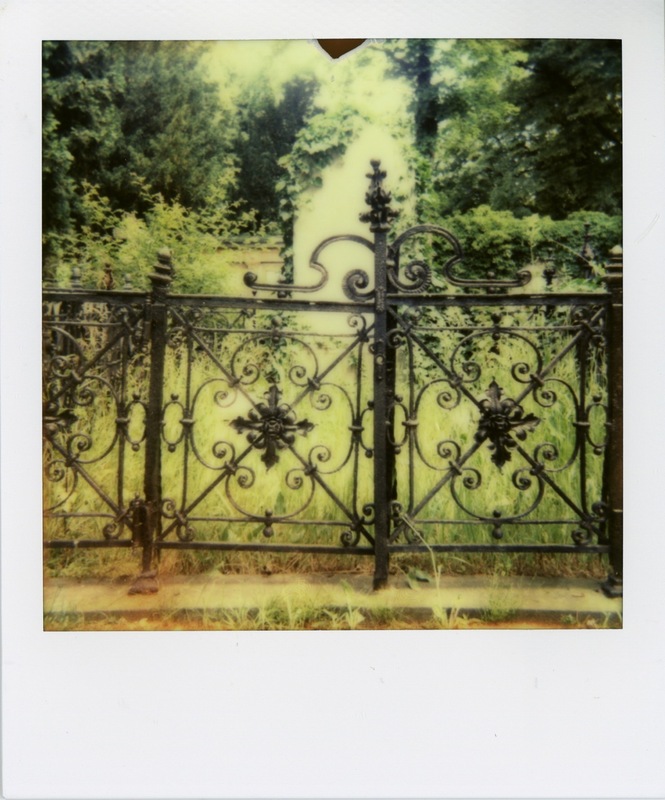 On Sunday I decided to take my polaroid camera to another one of these old places, the “Mehringdamm” cemeteries. Situated in the heart of a residential district, the area comprises in fact several distinct cemeteries, with the older ones situated within the newer ones. The oldest places are therefore located in the heart of sprawling area, cut off from the rest by a cordon of crumbling, ivy covered walls. By the time you get to that inner place, you feel like you have entered a lost world. The nearby residential buildings are barely visible, and you find yourself in a place that seems to be a world removed from the city. All around are overgrown tombs, crumbling walls, crooked, ivy covered crosses and weather worn statues of angels and saints. On a sunny summer day such as this one, the place is awash with bird song and the buzzing of insects. Trees and tall shrubs provide shelter from the sun, and the place is a playground for moving dapples of shadow and light. The whole place feels like a forbidden garden, a refuge from the hectic city life beyond its walls. In short: it is a very peaceful place. It is a cemetery after all. Peaceful it may be, but the tombs, crucifixes, and the statues depicting grieving figures remind you that this is a place of “eternal peace”. On a sunny day like this, it might be a very joyful place…. yet the place reminds you of death – yours, everyone’s… . This place is very old, the oldest graves I found date back to the early 1700s. Some famous people are buried here, the composer Felix Mendelsson-Bartholdy and the author E.T.A. Hoffmann for example. In an old place such as this, death seems a bit more – remote than it would be in a new cemetery, where fresh flowers and newly dug graves remind you that behind each one of those graves, there is grief; there are relatives and friends missing a dear one. Here, you know that the grief has passed, because the grievers have also passed away. So, for me at least, this seems more bearable – death does not quite appear as imminent as it does elsewhere. 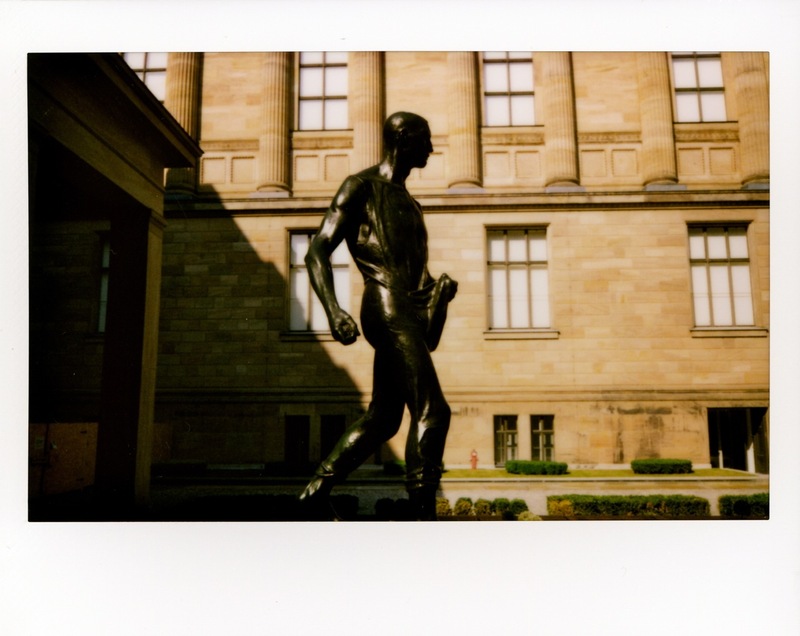 I have posted more photos taken recently with the Fuji Instax camera to the [instax page]. This batch was taken around the Kreuzberg area of Berlin. I’m still enjoying capturing the instant photos with this ugly little thing. 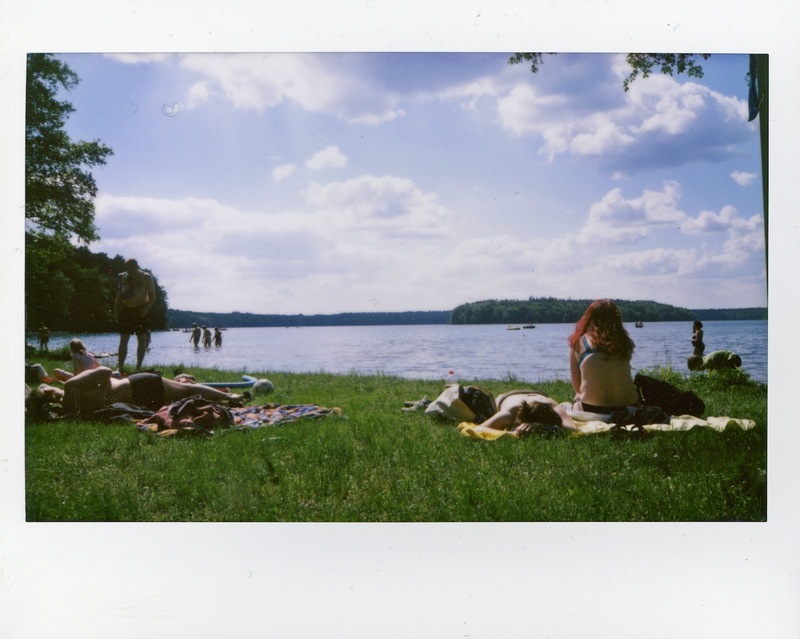 Check out both the City and the Summer sections of the instax page. 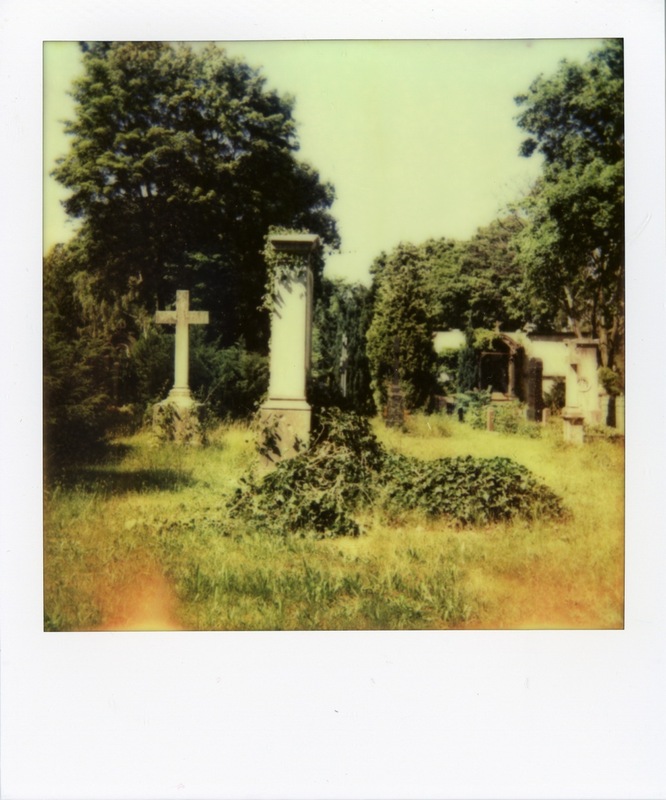 I recently took my two instant film cameras, the Fuji Instax 210 and a recently acquired Polaroid SX-70, to a couple of nearby graveyards. My main goal was to give the Polaroid its first serious try-out, but at the same time I wanted to find out how the two cameras compare. It should be stated first that comparing the two cameras may be a case of apples and oranges. The cameras and the films work differently and use different chemical processes, achieving very different results. They are also targeted at very different groups of people. Fuji seems to market its instax cameras towards the snapshot-happy crowd, trying to place the cameras as a party gimmick for young people (mind you, I very much doubt that the clumsy 210 camera is lugged around much to parties); if you browse the instax flickr groups, people are using the Instax for all sorts of shots – from moody nature pics to fashion shootings. Impossible Project on the other hand caters to the more art-oriented crowd, a fact highlighted by the various exhibitions it organizes around the world. 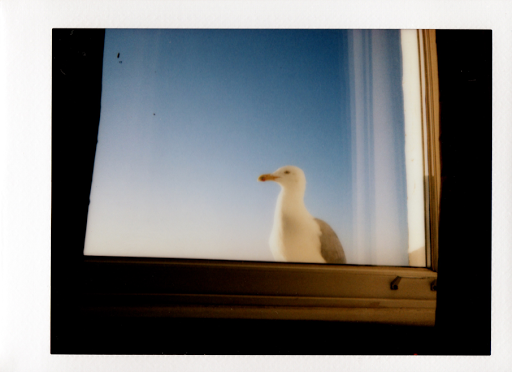 At the price that the new polaroid films sell, they are definitely not meant to be used for snapshots. Additionally, the imperfections inherent in the current film stock mean that its users are willing to embrace those. Nonetheless, having the two cameras with me for shooting under the same conditions and in the same environment provided me with a good opportunity to weigh the pros and cons of the two cameras for a specific project. 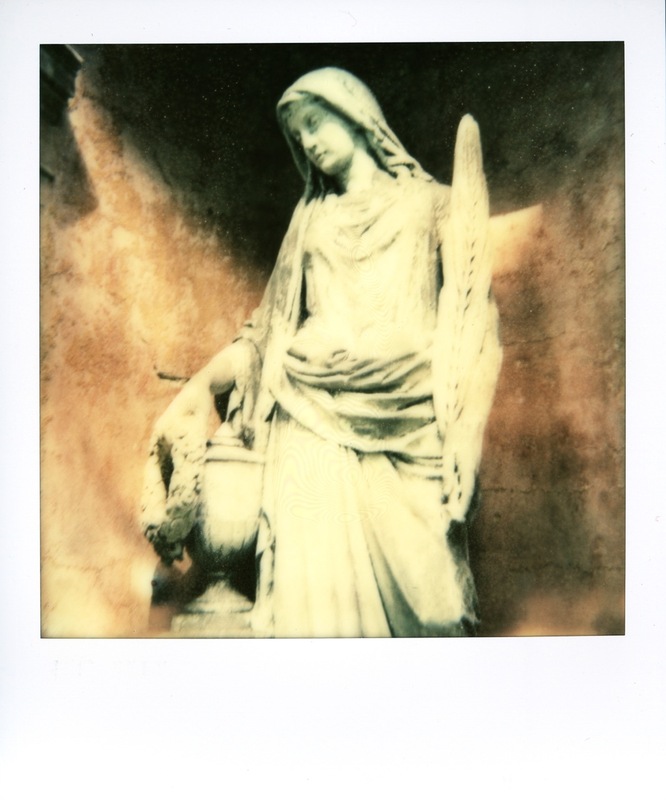 For the SX-70, I consider the results as mixed. 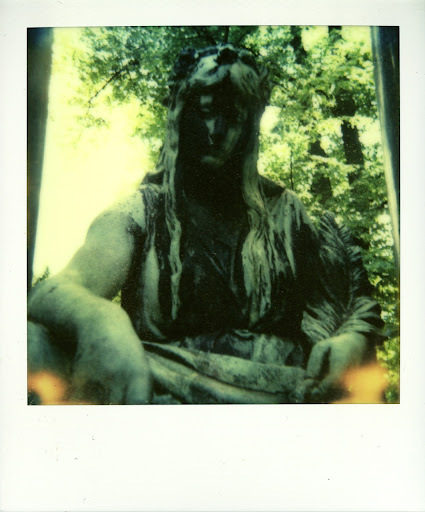 I like the otherworldly quality of the polaroids, which imbues the images with a dreamy, even ghostly mood that fits the subject matter extremely well, even giving the depicted statues a sense of timelessness. However, on some of the pics, the discoloration is a bit too intense even for me. I’m still learning to fine-tune the darkness settings on the camera, which may be part of the problem. Having shot some 20 photos, I consider about five to be good, and of those three to be better than good; although I should add that I really like those three. 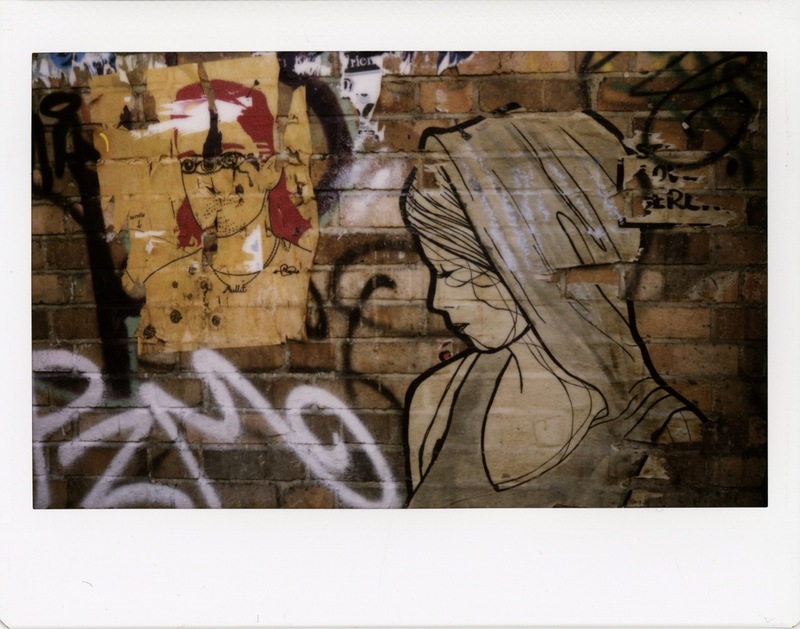 The photos taken with the Fuji Instax are very different in quality and in mood – more realistic, sure, but still a bit off – softer than digital or normal film would be, and thus, again, less realistic than straight photography. I was also surprised to see how well the camera handled more muted colors in less than sunny settings, having previously shot mostly colorful scenes on sunny days. 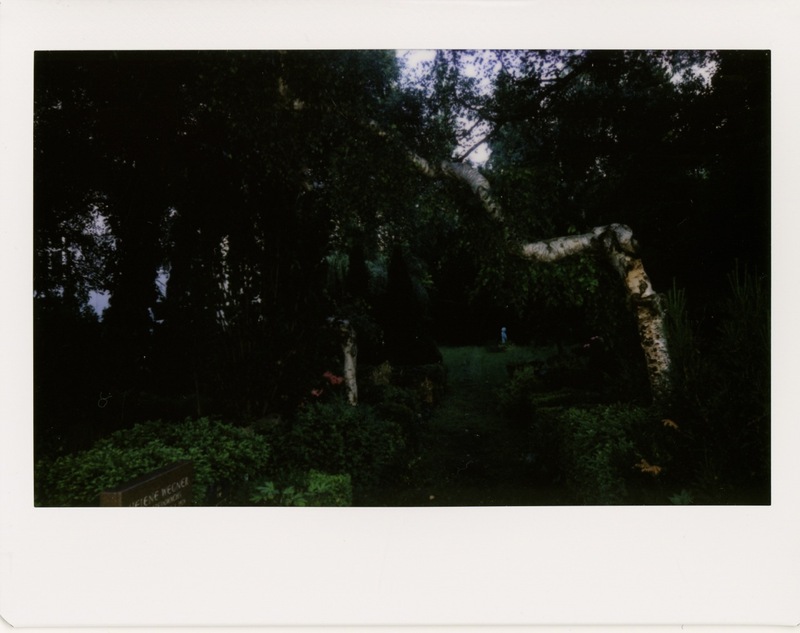 These muted colors give the resulting photos a very sombre feel, again very appropriate to the setting but totally opposite to the effect achieved by the Polaroid camera. On the down side, I am less than impressed with the shots where I used the flash – the flash is way too bright. Also, it doesn’t handle large contrasts very well – the light areas tend to come out all washed out. Overall, however, I got a larger number of satisfying photos from the Fuji, although, at the end, again only 3 or so which I find better than good. Beyond the aesthetics, there are other factors to consider when comparing the camera. The price of the film for one, you can get 20 instax pics for the price of eight polaroids. The Instax also delivers results faster, you can at least recognize what you shot 30 seconds after taking the picture – with the Polaroid, it takes 4-5 minutes. A couple of factors which weigh more heavily in favor of the Polaroid cameras is for one that Impossible Project offers a choice of films, including black & white, while Fuji just offers one. Then there is also the fact that there is a stronger community than there is for the Instax. The Polaroid flickr groups for example are a lot more active than those dedicated to the Instax, and Impossible Project itself is fueling the community through its web site (which offers plenty of advice as well) and through different exhibitions and contests (see also my earlier review of David Sylvian’s Glowing Enigmas exhibition). Overall I guess it comes down to a matter of taste if you prefer the one to the other, or for what purpose you intend to use it. I for one am happy to have both and will be using both, but for different ends. 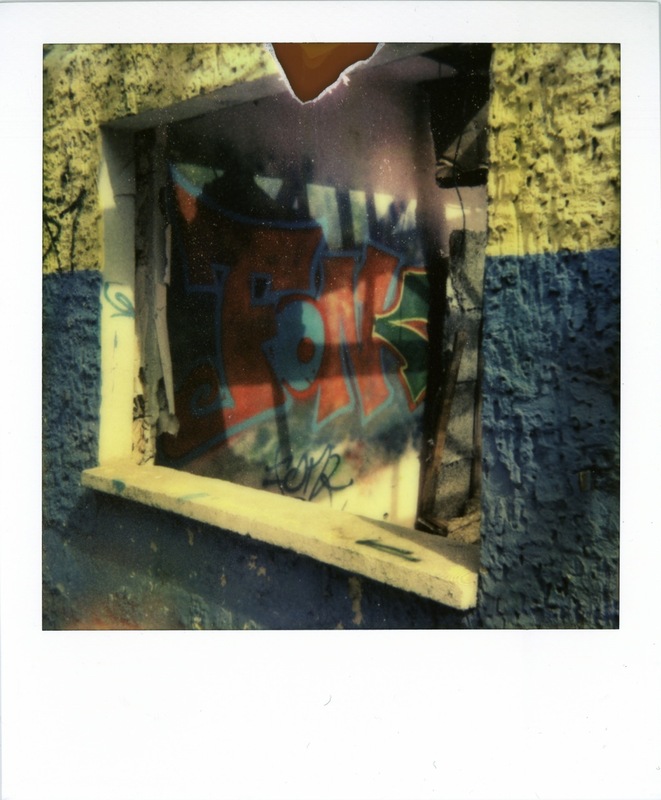 I uploaded a short series of very colorful instant photos that I shot with the Fuji Instax 210 instant camera over a couple of sunny days here in Berlin. Most of them were taken around the Old National Gallery and Alexanderplatz.